Previous studies estimated the energy output to be about nine times the energy invested in solar panels. By contrast, a new study published by the Royal Society of Chemistry's Sustainable Energy & Fuels examined the output from a typical rooftop system installed in five diverse American states. It found that the energy payout ratio ranges from a low of 14 in Alaska to a high of 27 in sunny Arizona – but only when homeowners are able to send surplus power to the grid. However, when homeowners install a battery and charge it with excess electricity before sending leftovers to the grid, the energy return on investment for the entire system is 21 percent less than solar panels alone, researchers Simon Davidsson Kurland and Sally M. Benson found. 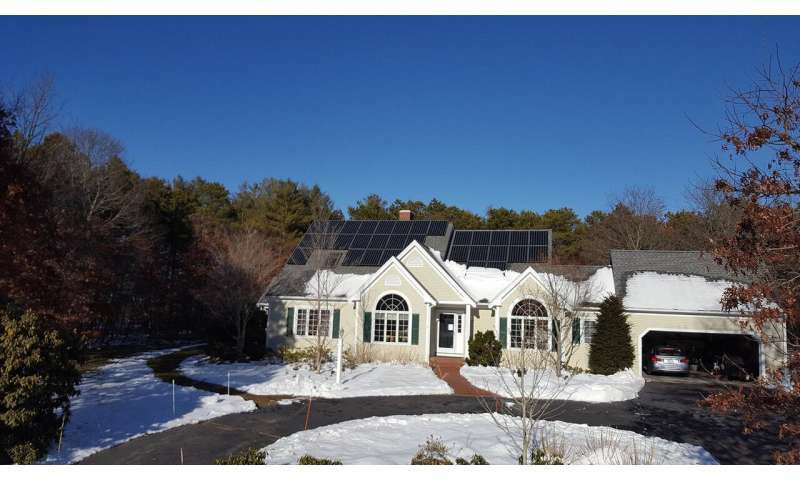 When homeowners have no battery and no grid outlet, extra electricity is just wasted. Then, the system's return on invested energy falls to seven in Alaska and a high of 14 in Florida – on par with earlier studies. Because homeowners in that scenario need to purchase electricity during the evening, adding a standard lithium-ion home battery improves the energy payback. "The overall high returns show the energy benefits of photovoltaics across a wide range of U.S. geographical regions and, presumably, elsewhere," said Benson, co-director of Stanford's Precourt Institute for Energy and professor of energy resources engineering. "But they also demonstrate that if a state encourages homeowners to invest in rooftop systems to reach clean energy goals, then letting excess power flow to the grid makes the most of those investments." The much-studied metric "energy return on investment" helps assess policies that cannot be measured purely in economic terms, like achieving environmental goals. For now, photovoltaic panels are made using energy mostly from fossil fuels, so a 14- to 27-times payoff in renewable electricity buttresses policies that support solar power. As a counter example, the main argument against corn-based ethanol is that more energy goes into making and delivering it than ethanol produces in a car. Financial payoffs for U.S. residential solar power, however, are unclear. Almost all states allow some selling of excess electricity to utilities, but how much homeowners get paid and how much they can sell varies. In most states, consumers get paid the same rate that they pay when they use the power. When the system is exporting to the grid, the customer's meter goes in reverse. In a handful of states, though, homeowners get paid based on how much money their electricity in total saved the utility – a much lower price. "As far as energy return on investment, it's difficult to justify adding batteries to residential PV systems as long as excess generation can be made available for other users of the grid," said Davidsson Kurland, who was a postdoctoral scholar at Stanford's Global Climate & Energy Project when conducting this research. He is now a postdoctoral researcher at Chalmers University of Technology in Sweden. There is hope for home batteries yet, Davidsson Kurland and Benson found. When selling to the grid is not an option, home batteries would hypothetically improve the return on the home system by 12 to 42 percent in the five states examined. The higher end of the range in the study is for a climate like Washington's, where early afternoons can see a lot of sun but little residential electricity use, creating an opportunity for batteries. The lower end is for Florida's climate, where heat and humidity drive air conditioning systems while the sun is shining even if nobody is home. In reality, consumers can sell excess power back to the grid in Florida and – with limits – in Washington. The current study acknowledges the dilemma. "As rooftop solar and large, photovoltaic power stations grow, electricity grids will not be able to accept more afternoon power, unless new uses of cheap afternoon electrons grow," Benson said. I expected better from a Stanford University 'study'. Firstly, they limit their 'study' to domestic/grid interaction rather than holistically studying the full gamut of usages/storages that do NOT involve the grid at all if the owner can charge their Electric Vehicle(s) batteries directly during the day OR from home batteries at night. Nor do they allow for increasing Electric Tools batteries for home repair/gardening/mowing/snow-blowing etc. If one includes all those factors, then the economic case for domestic solar complete with appropriate level of home battery storage and battery tools/cars usages is more compelling, and their 'study' would have been of more relevant/realistic use for both home-owners and utilities companies when making longterm planning decisions about the most efficacious/economic domestic/grid system 'balance' and 'interaction' setup. The grid has the same 7-8% transmission loss. Charging cordless drills isn't going to make much of a difference. The economic case for solar power is still pretty bad due to the high price and short lifespan of batteries. You're just confusing economy in terms of direct energy expenditure, and in terms of money. Consider, when you pay higher prices for your energy in the form of solar panels and batteries, you have to earn more money. Earning more money means running the economy faster, which means consuming more energy. Alternatively, you can choose to downgrade your living standards. This is why renewable energy is being subsidized: to make other people pay. When you go to work in the morning, does your chauffeur drive your car back to the mansion to be recharged? You missed my point about in situ use for all those battery-electric tools and one/two car charging drastically reduces/eliminates domestic/grid interaction altogether. Charging cordless drills isn't going to make much of a difference. I have battery-electric chain saw, lawn mower, grass/brush trimmer; many friends are trying to get bat-electric ride-on mowers/brushcutters for their larger blocks; some want bat-electric tractors/milling equipment etc etc. Living standards actually increase!... due to better economy, healthier/safer environment and more power independence/sustainability/security. Commercial/business premises/properties already installing solar panel systems for their operations; including charging cars/forklifts etc etc.